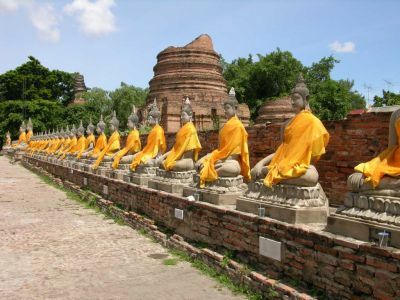 Ayutthaya is an old ruined city located at a distance of 85 kms from Bangkok. This ancient city was founded around 1350, and was once the capital of Thailand (Siam). The city was attacked and razed by the Burmese army in 1767 who burned the entire city and it has been in ruins since then. I was interested to visit UNESCO World Heritage Site after looking at some of its photos on internet. So we rented a bike and headed to Ayutthaya early in the morning. Ayutthaya archaeological site contains ruined, burnt out palaces, temples, monasteries statues and more. It gives the glimpse of what an impressive city it must have been earlier days. The most interesting place here was Wat Mahthat. The iconic photograph of the Buddha's head entwined in the roots of a fig tree represents this place the best. You can find the rows of headless Buddhas and large ruined structures here. Another attraction was Wat Phra Si Sanphet, which is known for its distinctive row of Thai-style stupas. The temple once housed a 16 m high Buddha covered with 340 kg of gold, but the Burmese set fire to the statue to melt the gold and destroyed the temple in the process. 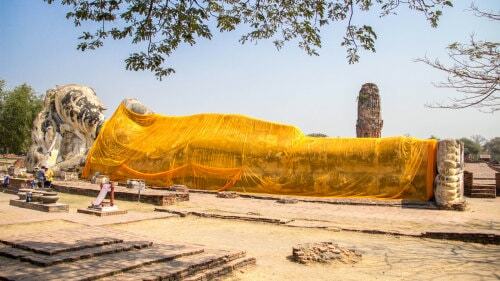 Wat Lokaya Sutha has 42 meters high and eight meters wide reclining Buddha statue. Ayutthaya was said to be located on an island surrounded by three rivers connecting the city to the sea. This site was chosen by the kings, as it was located above the tidal bore of the Gulf of Siam, thus preventing attack of the city by the sea-going warships of other nations. Now there are no traces of water, and the place is very dry and hot. There are many shelters to take rest while you are exploring these ruins. You can also visit the beautiful Bang Pa-In Summer Palace on the way the way to Ayutthaya. All the roads in Thailand are wonderfully laid, but it is not the right country to explore on bike; as 2 wheelers are not allowed on most of the roads; and we were flagged off by the Thai police twice on the way to Ayutthaya and later were caught by the cops, despite lot of precautions. Most of signboards are in Thai language and we had missed to notice that we are riding on wrong road. Had to plead, negotiate and bribe to get the driving license back. The best way to exlore this historical city is by taking a One Day Tour organised by various travel companies. Explore this magnific city in the world located on two continents - Europe and Asia. During its almost 2,000 year's of history, Istanbul has been the capital of the Roman, Byzantine and Ottoman Empires. ** Navigers also provides customized tour as per your preference. Use "Plan your trip" button present on Navigers site. ** You can avail additional discounts on bulk booking. The Hornbill festival is held every year from 1st - 7th December, in Kohima Nagaland, Northeast India. It is one of the most cherished festivals of Nagaland, where locals arrange a out of the world show with great zeal and enthusiasm. This festival is organized by the Government of Nagaland for promoting cultural heritage of Nagaland. It is a assured entertainment package with colorful mixture of dances, performances, crafts, parades, games, sports, food fairs, religious ceremonies and more. This holiday package is perfectly designed to capture the rich essence of this beautiful festival. Day 01 / Dec 02 Arrive at Guwahati OR Jorhat airport and drive to Kaziranga. Please see arrival/departure section for group pickup timings. Day 02 / Dec 03 Early morning visit to Kaziranga National Park. Subsequently drive to Majuli, crossing the mighty Brahmaputra on a ferry. Overnight at Majuli. Day 03 / Dec 04 Full day at Majuli. Visit to the Vaishnavite Monastery and walks in the villages. Day 04 / Dec 05 Drive from Majuli to Kohima. Overnight at Kohima. Day 05 / Dec 06 Full day at the Hornbill Festival. Day 06 / Dec 07 Full day at the Hornbill Festival. Day 07 / Dec 08 Village visits around Kohima, to the dwellings of Angami Naga people. Day 08 / Dec 09 Drive to Kaziranga for overnight stay. Day 09 / Dec 10 Drive to Guwahati and depart. All meals during the tour starting from dinner on Day 1, ending with breakfast on Day 9. Transport from your location to your airport of arrival – Guwahati/Jorhat. Addition beverages, snacks and mineral water. Tips and other expenses not mentioned in the inclusion mentioned above. Due to the nature of the places we are visiting, the type of accommodation during this tour varies considerably and is often very basic. We will be staying at a charming, simple and comfortable hotel in Kaziranga, a very basic bamboo-hut guesthouse in Majuli, simple and comfortable guest-houses in Kohima. • 01 Mineral water bottle per person per day. • Any other services which is not mentioned above. Tour Price: This price is derived for couple booking. Contact us for discounted rates on bulk booking. We would suggest reaching Kohima by 30/Nov/2017, so, that you can enjoy the inauguration part of the festival on 03/Dec/2017. Please contact us, if you need a customized package based on different travel dates and duration.